Who says video games can't be healthy? It's just a matter of finding the right peripheral, you see. Like a stair stepping device that hooks up to a PlayStation, only allowing kids to play so long as they pump at those pedals. Do your children look upset at the prospect? Explain to them that it's a stair-climbing game . They'll be right there with you. 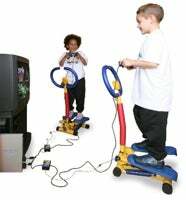 Gymkids's Step2Play device is intended to help combat child obesity, which, to be sure, is a noble cause. They're meant primarily for kids between the ages of 7 and 11, and run for £115 each (~$219), but unfortunately you can't just cut and run; parents actually have to supervise the kids while they're on the machines (not such a bad idea, though, since then maybe parents will be forced to see what their kids are playing). The device is supposed to ship by Christmas in the UK.